Over the last days and weeks some traders have been worried if the currently ongoing correction in the markets will evolve into a crash, or if it is just a normal correction. The main difference between a correction and a crash is the panic level. But it is not the absolute level of .VIX, the CBOE implied volatility meter. It is the difference between realized and implied volatility that defines a crash which defines real panic. Divergence in market breath indicator (stocks above 20 day average) might also suggest it is not a crash. And having a longer-term look at the market one can clearly see that the movement of the last two weeks hardly has any significance when it comes to the real big moves we all are frightened or hope for. This does not mean that this correction might not be the beginning of a bear market. 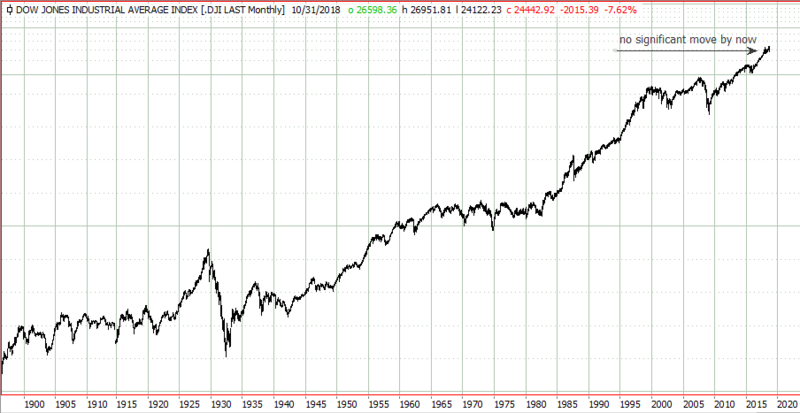 Going below 24000 in DJI would be a strong argument for this perspective.